Weekend. . 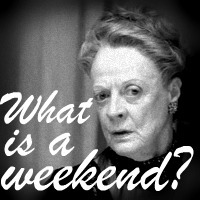 Images in the Downton Abbey club tagged: downton abbey maggie smith. This Downton Abbey icon contains chân dung, headshot, and closeup.